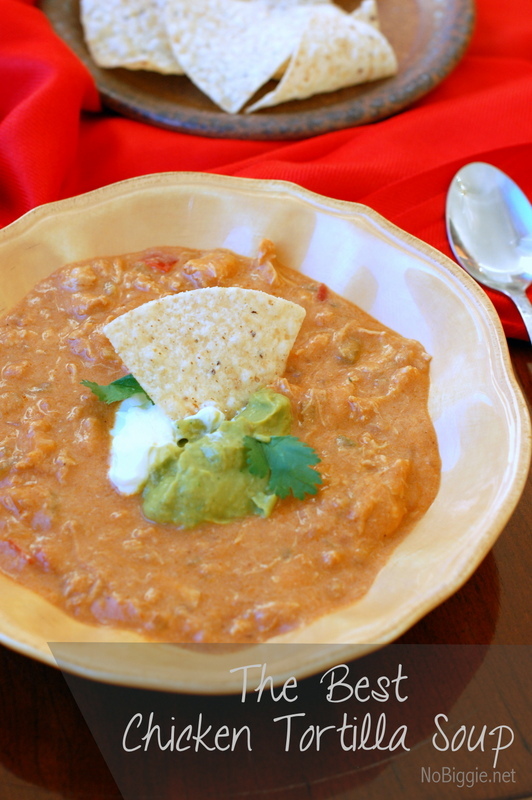 The Best Chicken Tortilla Soup recipe | NoBiggie.net | makes great use of rotisserie chicken. This week’s recipe is definitely ‘all things delicious’. 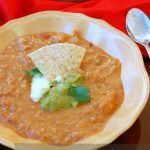 It’s the best chicken tortilla soup that I’ve ever had, and it’s easy too, because you can use a rotisserie chicken. It’s the kind of soup you want to make a big batch of, because it makes the best kind of lunch the next day. Make the soup: Heat the butter in a large stock pot or dutch oven over medium heat. Sauté onions, celery and garlic until soft. Add a splash of chicken stock, and then the red & green bell and 1/2 jalapeno pepper. Cook for 2-3 minutes to soft. Add all of the spices (salt, pepper, cumin, coriander, sugar, chili powder), and stir until fragrant. Add the remaining chicken stock, tomato puree and Worchestershire sauce. Mix well and bring to a boil. Add the shredded chicken and reduce the heat and simmer for 20 minutes or longer. Make the cheese sauce: Melt the butter in a heavy sauce pan over medium heat. Stir in the flour to make a paste. Slowly add the rest of the ingredients, constantly stirring, until thick and creamy. Season with salt and pepper and remove from heat. Add cheese sauce to the soup, stirring to mix well. When ready to serve, top with cilantro, sour cream and guacamole and tortilla chips. Oh it’s so good! I hope you make it! If you’re looking for more great recipes using rotisserie chicken, than you’ll love these! This looks so good that I want to make it tonight! I’m a big fan of chicken tortilla soup, but so often I’m disappointed when I order it at a restaurant.